Chia pudding has been around for a while, and a lot of the health conscious people out there know about it. I made my first attempt for chia pudding a while ago, going for a chocolate flavour, but for some reason I was not blown away by it. Until something happened. I tried a different recipe and this one tasted so good, that I have been having chia pudding for breakfast everyday for the past few days. I am not kidding, it is that addictive. The other big plus of a chia pudding is that it is so incredibly easy to make, you will think it is a joke. I prepare mine in the evening, and there is nothing better than waking up in the morning, knowing that your delicious breakfast is waiting for you. But the biggest advantage of a chia pudding is the nutrients it contains, that will boost your energy and provide your body with so much goodness. Chia seeds are loaded with antioxidants! Antioxidants fight the production of free radicals, which can damage molecules in cells and contribute to ageing and diseases like cancer. Some claim that chia seeds contain more antioxidants than blueberries. They are packed with fiber, and this is the reason you can make amazing puddings with them. Because of all the fiber (10 grams in only 2 tablespoons), chia seeds can absorb up to 10-12 times their weight in water, becoming gel-like and expanding in your stomach. Fiber can help reduce inflammation, lower cholesterol and regulate bowel function.With two tablespoons of chia you get 1/3 of the daily recommended fiber intake! Chia seeds are a good plant-based protein source. By weight they are 14% protein, which is quite high compared to most plants. Chia seeds are also high in omega-3 fatty acids. Chia seeds’ lipid profile is composed of 60 percent omega-3s, making them one of the richest plant-based sources of these fatty acids — specifically, of alpha-linolenic acid, or ALA. The omega-3s in chia seeds can help reduce inflammation, enhance cognitive performance and reduce high cholesterol. There are many other benefits that chia seeds have, but I will stop here otherwise the post will go on for too long. And I am sure all you want to know now is how to make this nutrient-dense and delicious pudding! So without further ado, here is the super simple recipe for an awesome breakfast or dessert. For the topping (optional): blueberries, strawberries, cacao nibs, bee pollen, nut butter… the options are endless). 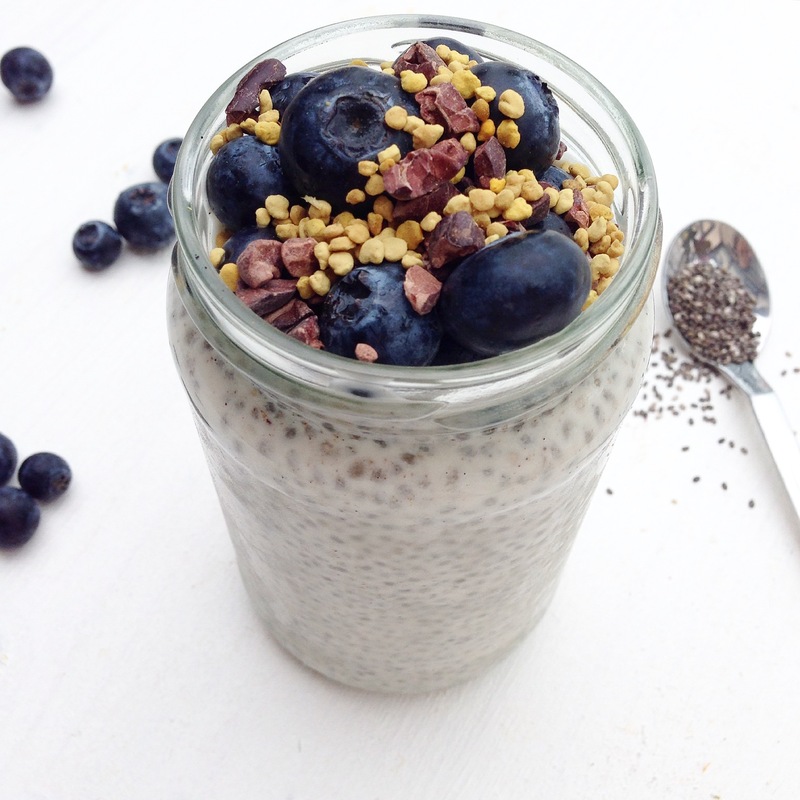 Place the chia seeds in a bowl or glass jar and top them up with the coconut milk. Add the honey, vanilla and almond milk and mix well using a spoon. Cover the jar or your bowl and place in the fridge overnight (or for 8 hours). 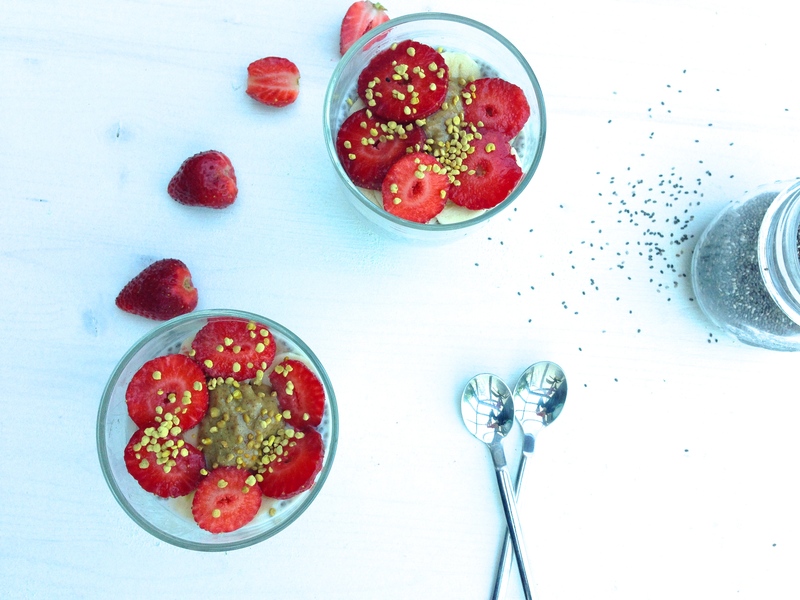 In the morning, you will find your chia pudding has become much denser and has a thick consistency. Mix it well with a spoon to get an even pudding mixture. – one is with blueberries, raw cacao nibs and bee pollen, and the other one is with strawberries, banana, almond butter and bee pollen. I also produced the almond milk on my own. 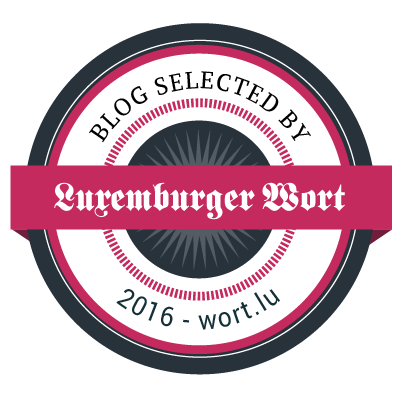 😉 – Yummy!